Flower pancakes (화전; hwa jeon) in the spring time have been a tradition with long history, which seem to find their roots dating back to the Goryeo Dynasty (918-1392) or even before that. Hwajeon made with azalea in the spring time is the most well known kind, although other edible flowers are used, such as chrysanthemum in autumn. Hwajeon is the only sweet jeon (pancake) I know, but the sweet flavor itself comes from sugar syrup or honey drizzled over the crispy, sticky-soft pancakes. It is a traditional food for March 3rd by lunar calendar (April 16th this year) as well, called 삼짇날 (samjitnal), which is the day of celebrating the return of spring. Samjitnal is also often referred as the day that swallows return from the south. Here I tried to keep the spirit of this Korean tradition with the ingredients I can easily get – which means finding a small container labeled ‘edible flowers’ at a grocery store rather than picking flowers from a nearby park and taking my chances at ‘edible’ vs. ‘not-so-edible.’ This time it also means another bottle of baekseju (백세주, an herbed rice liqueur) poured into a pot, which provides a light herbal infusion in sweet syrup. Rice wine syrup (baekseju syrup) – Reduce 1 cup of baekseju (about 1/2 bottle) by half over low heat. Add 2 tablespoons (TBSP) of honey and 1 TBSP of sugar and stir to dissolve completely. Keep over low heat until the liquid starts to thicken. Remove from heat. As the syrup cools, it will thicken more. Set aside. 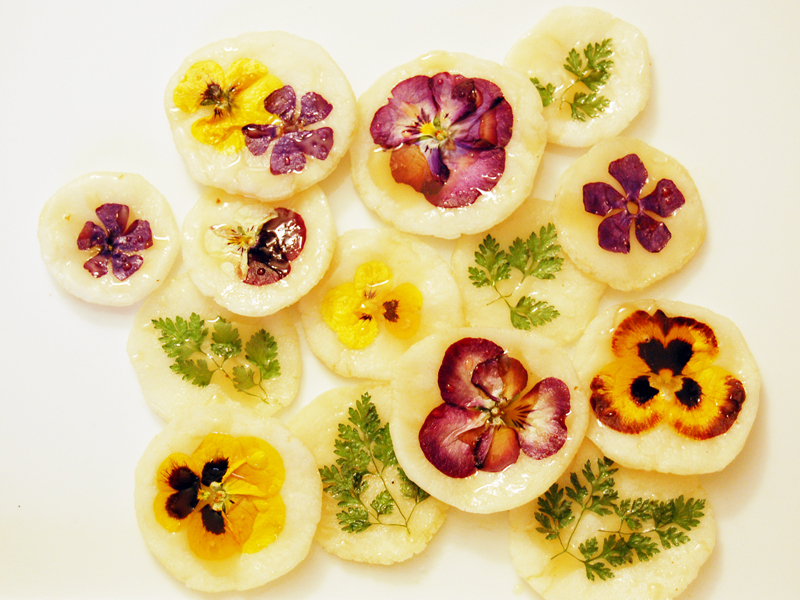 Making flower pancakes requires only sweet rice flour (찹쌀가루; chapssal garu), salt and hot water. The recipe below makes about 20 pancakes of 1″-2″ in diameter. Mochiko brand sweet rice flour is available at Asian markets. A small box of mixed edible flowers ($2.99) and a small bunch of chervil ($1.50) come from Chelsea Market. baekseju ($5.99) is available at Astor Wines. oh my god they are so cute and beautiful. I have never seen something like this before. Thank you for your amazing post. Thank you for reading and for your encouraging comment! Making and eating hwajeon put me in all springy mood so it was great fun all around. Enjoy your day! Does anyone know where you could go get these in Seoul, versus making them at home? I’ve seen similar things at the open markets. Shinshine tends to do her own spin on these dishes.